Last Friday I had the opportunity to speak to employees of the Scottish Environment Protection Agency and Scottish Natural Heritage at Stirling, as part of a cycling to work initiative organised by Stirling Cycle Hub. I am a firm believer in the fact that commuting to work should be most importantly one thing: fun. 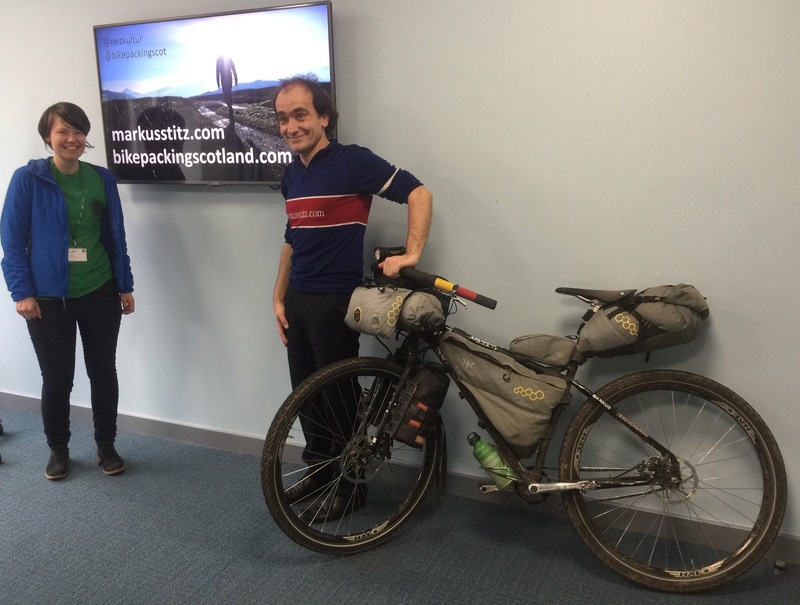 And having cycled home many times from Stirling/Bridge of Allan to Edinburgh, it was great to join the dots and connect the commuting and the trip around the world. To a very interested audience, including my friend Scot who composed music for my trip, I talked about how my commute of approximately 65km had not only had given me the strength I needed to ride a singlespeed bike around the world, but also a great measurement to relate to whenever the going got tough. Taking two and a half to three hours almost each day was a big commitment back then, but looking back I wouldn’t change that at all. Especially after a long and stressful day in the office, thankfully there weren’t too many, it was fantastic to switch off on the bike, enjoy the beautiful scenery or the tranquility of the darkness, and arrive home relaxed. And whenever I struggled with the huge distances I had to cover at times, I simply broke those down into the length of my commute, and suddenly things wouldn’t look as bad as they did initially. The most important message of the talk for me was that I enjoyed what I was doing. I was doing something I was and still am passionate about. And sharing it to inspire other people is even more rewarding. A big thanks to Emma from Stirling Cycling Hub for booking me and organising everything, and to Susanne for putting us in touch. If you are interested in something similar at your place of work, please get in touch. I am happy to announce a few more opportunities to speak about my travels around the world and bikepacking in Scotland. I will be at the Scottish Cycling, Running and Outdoor Pursuits Show in Glasgow from 10 to 12 March, where you can also see my bike at the Cycle Law Scotland stand. I will be speaking for 20 minutes at the following times: Friday 10th March – 1.15pm, Saturday 11th March – 11.55am and Sunday 12th March – 11.55am. You can buy tickets here. Next up is an event which I am really excited about, which showcases how adventurous Edinburgh is. In the second instalment of a series of Bikepacking Scotland events at Craigdon Mountain Sports in Edinburgh I have invited Jenny Tough, Geoff Allan and Dan Bailey to join me on stage for a Q&A session hosted by Dan. The format worked very well last year at Ronde, where Lee Craigie and Emily Chappell joined for a discussion about bikepacking, also hosted by Dan. This event will be about the different approaches to adventure the three of us have. Jenny has recently ran across the Tien Shan in Kyrgyzstan, while Geoff is the author of the Scottish Bothy Bible, which lists (almost) all bothies in Scotland. Join us for a tenner on the 16 March at 7pm in Edinburgh, tickets are available here. The next event in Aberdeen will be about my photography, spiced up with a few memorable stories from the road. 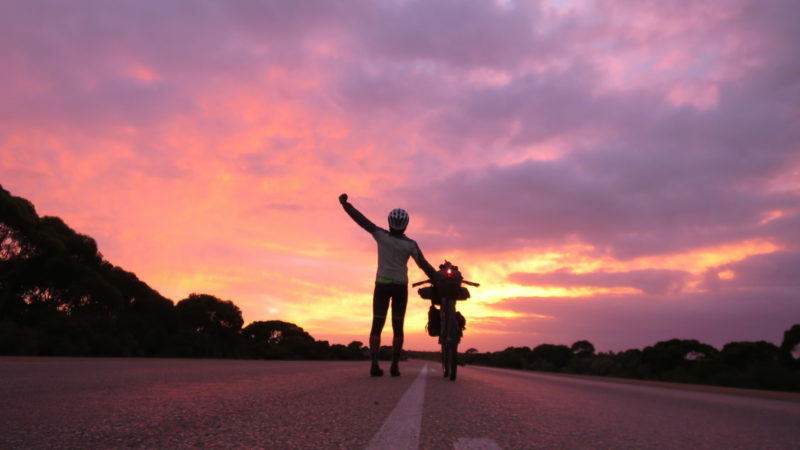 After spending a year on my singlespeed bike cycling 34,000km though 26 countries I talk about how I captured the trip in pictures and videos with a very lightweight and minimal setup, using a Canon S120, a small tripod, my iPhone and a GoPro camera to share the best moments from the trip on social media. I am looking forward to be back in the Granite City on 24 March, tickets for £5.30 can be purchased here. All dates can be found in the talks section here. I you would like to book me for an event or a workshop or if you have recommendations for me where to speak, please feel free to contact me here. Thanks for reading and I hope to see you at one of the events soon.